In my home, my leaning mirror and plant make me smile. 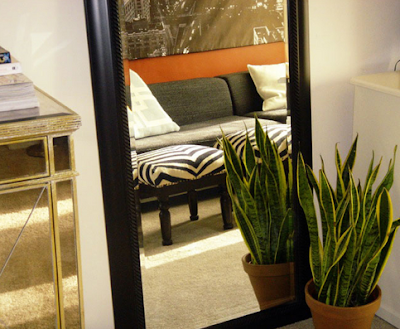 They have their own niche in our little space and due to our floor plan, the reflection allows for a connection to almost everything else in the room and into the other rooms. What's your fave accent(s) in your home? 4 Responses to "HAPPY ACCENTS IN YOUR HOME"
Curious, and way after the point I admit, but how do you keep your mirror from falling/sliding down? Is it the plant, or do you attach it to the wall? Am about to try something similar in my new apartment, and am at a loss! Katrina - the mirror is just on the carpet, leaning against the wall. No need for any "holding" agent. It's pretty heavy so it stays in place. If you are worried about your mirror sliding, try velcro. You can buy it at an art supplies store and apply it to the back of the mirror and the wall.